What Makes the Leaves of a Knock Out Rose Turn Yellow? How Much Sun Do Knockout Roses Need? How Deep Does a Knock Out Rose Bush Grow? What Type of Fertilizer Is Best for Knockout Roses? What Kind of Fertilizer for Knock Out Roses? Knockout roses provide a stunning display of blooms from early spring until the first frost. These plants are chosen because they are hardy and resistant to infections. Even the hardiest plants will develop problems from time to time. The leaves of a knockout rose will turn yellow when the plant is affected by various climate and soil conditions. Knockout roses grow best with a steady water supply. Too much water will cause the leaves to turn yellow. Once the moisture level is balanced, new green growth will appear. Roses prefer room to grow. If the plants are spaced too closely together, the leaves may turn yellow. The plants must be thinned out or pruned to provide better ventilation. These tiny pests love to attack the underside of the leaves. To remove them, spray the underside of the plant leaves with a steady stream of water. This will knock them off the plant and remove their webs. To prevent spider mite infestations, keep rose beds free of weeds and decomposing leaves. This dreaded condition affects the whole plant. A rose infected with black spot will display leaves with jagged black spots; these spots may be surrounded by a yellow halo. The leaves will turn yellow and drop. Completely remove and discard any infected leaves. Black spot can develop when water is allowed to sit on the leaves. To prevent black spot and limit its spread, water plant at the base and avoid spraying the leaves directly. Soils lacking nitrogen will cause the knockout rose's leaves to turn yellow. Apply a nitrogen-rich fertilizer in early spring and again at the peak of blooming. Plant knockout roses in a sunny area that receives 6 to 8 hours of direct sunlight a day. Partially shaded locations are fine, but may inhibit color and abundance of blooms. Hold the spent flower in one hand and clip the stem with shears in the other. Always use clean, sharp pruning tools. Cut the stem back right above the first leaflet with 5 leaves. Prune out any deadwood, twiggy growth or damaged stems that you notice while you’re there with your shears. Deadhead enthusiastically following heavy rains, which will dislodge many loose petals from spent knockout blooms. 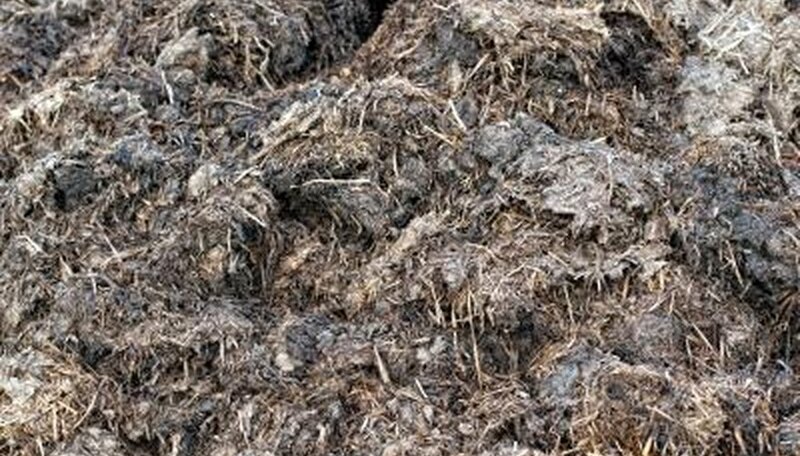 Drop healthy spent rose material into your garden or onto your compost heap. Fill the bucket approximately halfway with cool water, and take it out to the Knockout rose bush with you to hold the rose stems as you cut them. Clip the rose stems from the bushes with the pruning shears, placing the cuts 1/4 inch above a leaf node. Cut the stems off at the length you require for your arrangement. Place each cut stem into the bucket immediately after you clip it from the shrub. Continue cutting until you have the number of stems you need for your arrangement. Take the bucket inside, and place it in a cool and dark location (a refrigerator is ideal) for two to three hours. If you lack refrigerator space, a cool and dark basement would suffice. Place the Knockout stems into a cut arrangement after they sit for the recommended time. Purchase knockout roses from a local nursery, retail center or garden catalog. Choose a color that complements the area it will be planted in. Take into consideration the size of the knockout rose bush when fully grown. Select an area in the landscape to plant the knockout rose bush. Choose an area that has full sun and loamy soil. Choose an area that is free of standing water and one that drains well. Dig a hole that is 6 inches wider and 6 inches deeper than the root ball of the knockout rose bush. Set aside the removed dirt and place it in a wheel barrow. Remove any rocks from the dirt and the hole. Mix a rose fertilizer into the dirt that was removed. Set the mixture aside. Remove the knockout rose bush from the container or shipping material by gently pulling it away from the container or shipping material. Place a few inches of dirt mixed with the fertilizer into the bottom of the hole. Place the knockout rose bush root ball into the hole. Back fill the hole with the fertilized dirt, mounding the dirt around the top of the knockout rose bush. Spread mulch around the mound and water the knockout rose bush thoroughly. Water frequently the first several weeks until the knockout rose bush is established in the garden. Knock Out rose root depth varies due to soil density and plant age. Knock Out roses begin in an 8- to 10-inch-deep hole with a spread of at least 24 inches. As the bush grows, the anchor roots reach farther into the soil to establish support. Watering to a depth of 24 inches is often sufficient to reach the majority of roots. Watch for wilted flowers. When they begin to fade and wilt, that’s when knock out roses can be deadheaded. Cut them off just beneath the wilted flower with a pair of hand clippers. Discard the clippings, rather than letting them fall to the ground, to keep your rose bed tidy. Remove any dropped foliage beneath your Knock Out roses following the first hard frost in late fall. This will help keep diseases at bay next year. Wait until sustained temperatures are under 20 degrees Fahrenheit and most of the plant’s leaves have dropped. Use sharp, clean shears to prune your Knock Out roses back when they've gone completely dormant. Cut out any dead or damaged wood. Clip off long or rangy stems that could be damaged by the weight of snow and ice. Trim them flush with the rest of the plant’s foliage. Apply 3 to 4 inches of straw mulch to protect the base and roots of the rose bushes. Rose breeder William Radler is credited with the development of the Knock Out rose variety. It was a 2000 winner of the All American Rose Selections (AARS) committee. There are several types of Knock Out roses including the Knock Out, Double Knock Out, Blushing Knock Out, Pink Knock Out and the Rainbow Knock Out. According to the Office of Agricultural Communications at Mississippi State University, Horticulturist Norman Winter recommends a feeding every four to six weeks with a slow release fertilizer of 12 to 6 to 6 ratio. The ratio 12 to 6 to 6 refers to the amounts of nitrogen, phosphorus, and phosphate present in the fertilizer. Knock Out roses fit well into most landscapes and deadheading the old growth of blooms is not required. The roses are considered self-cleaning. If left unpruned, the roses may reach approximately 3 to 4 feet wide and 3 to 4 feet tall. Soak your Knock Out rose's planting area to the depth of the rose's roots immediately after you transplant it into your garden. Keep a newly planted Knock Out rose's soil moist until it establishes itself and produces new growth. Test an established Knock Out rose bush's soil once weekly to test its moisture level. Use your finger or a small trowel to dig into the top 4 to 6 inches of the soil. Only water when these top few inches of the soil are dry. Use a hose or watering can to give your Knock Out roses roughly 2 inches of water early in the morning if the soil is dry. Do not wet the Knock Out rose's stem or foliage. This encourages disease and fungal growth. Water your Knock Out roses with 3 inches of water the day before you apply fertilizer. All roses require four to six hours of full sun every day to grow and produce their bright blooms. Plant Knock Out roses in spots that get full, bright sun and quick drainage and have at least 3 to 4 feet of space per rose. 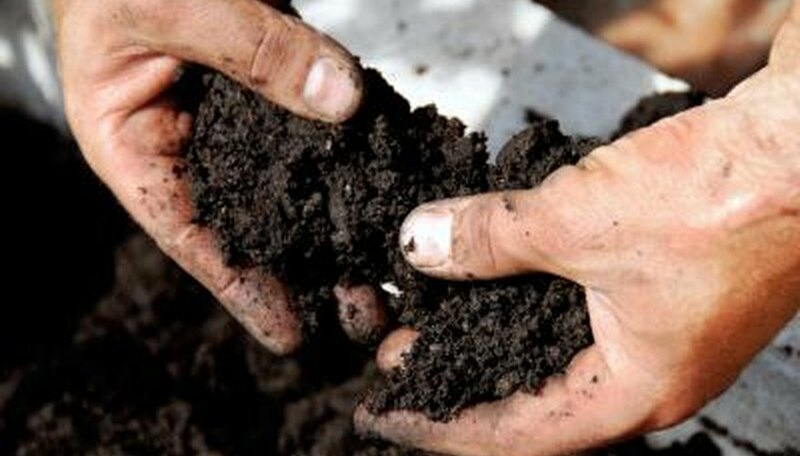 Use plenty of organic compost at planting to give the roses a rich, crumbly and moist foundation. The long-term nutrition of organic compost leads to good rose success. 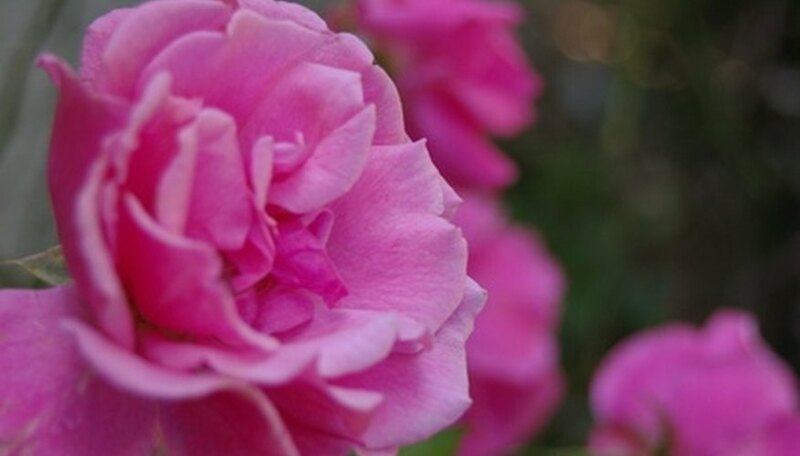 Roses are acid-loving plants and enjoy both synthetic fertilizer and organic amendments. Use rose-specific or complete fertilizer, or fertilizer for acid-loving plants like azaleas, and supplement with organic fertilizers like bone meal, fish emulsion and rotted manure. The Clemson Cooperative Extension and All-America Rose Selections both recommend heavy feeding schedules for roses. 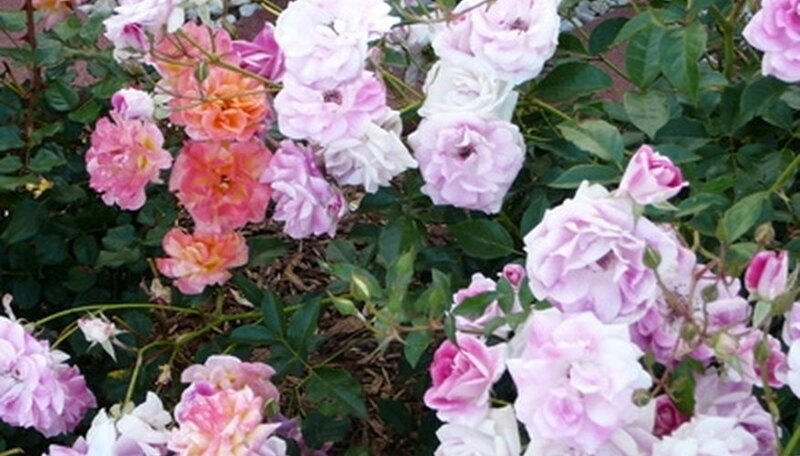 Give the Knock Out roses fertilizer with the first growth in spring, then feed them after each flush of flowers. If your Knock Out isn't blooming regularly, feed it once a month. Always water the rose immediately after feeding. Discontinue feeding six weeks before the first frost in fall to encourage the bush to enter dormancy. Late-summer growth will die in heavy frost and may damage the plant. Roses cannot survive on fertilizer alone and need ongoing soil quality and care. 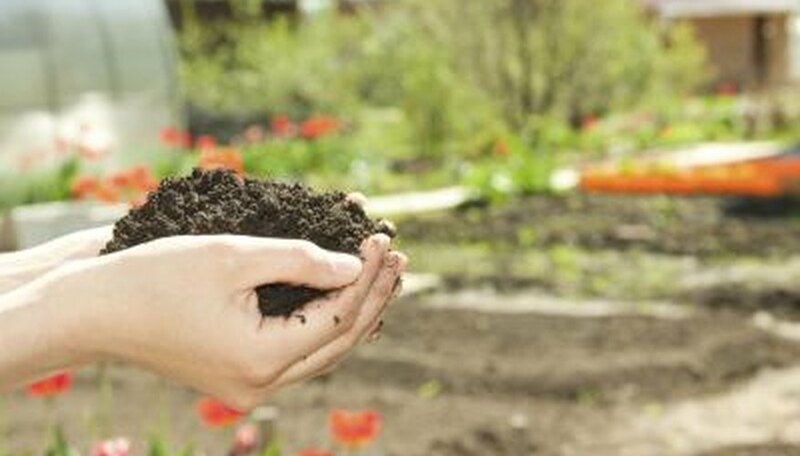 Mix organic compost into the soil around the bushes in spring and again in mid-summer to maintain the soil's richness, and use 2 to 3 inches of organic mulch to keep the soil warm, dry and weed-free. As the mulch breaks down, mix it into the soil and refresh. Knock Out roses were developed by Bill Radler and are sold by the Conard-Pyle Company. Carpet roses were developed by Noack Rosen and sold by Anthony Tesselaar Plants Pty. Ltd. 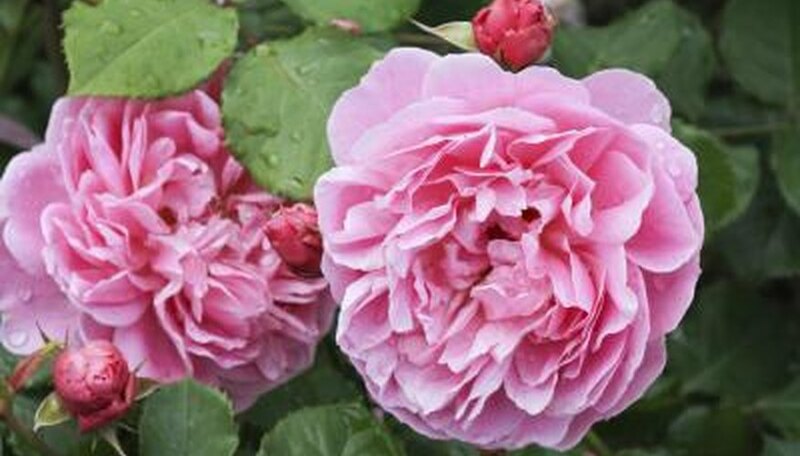 Knock Out roses are a shrub rose that grows approximately 3 to 4 feet tall, while Carpet roses are a ground cover rose. Both are 3 to 4 feet wide. Both roses are maintenance-free. They do not require deadheading or pruning, though you can if choose to control growth. They are formulated to be disease resistant and tolerant of drought. Both roses will grow well in zones 5 through 10 and may be used in colder climates with appropriate winter protection. The Carpet rose is available in the following colors: amber, appleblossom, coral, yellow, pink, pink supreme, red, scarlet and white. Knock Out roses are under seven different names: Knock Out (cherry red single bloom), Double Knock Out (cherry red double bloom), Pink Knock Out (pink single bloom), Pink Double Knock Out (pink double bloom), Rainbow Knock Out (pink with yellow center), Blushing Knock Out (light pink), and Sunny Knock Out (yellow). Deadhead any remaining blooms in the late fall once the Knock Out rose tree has stopped blooming. Throw away dead blooms immediately instead of letting them fall to the ground, since that can promote disease around the tree. Cover the entire area around the Knock Out rose tree with a 1-foot layer of pine straw or pine bark to keep the ground and roots warm. BlueGrass Gardens advises gardeners not mulch before mid-November because roses need cool temperatures to develop some winter hardiness. Cover the entire rose tree with burlap if you are expecting snow. Move any Knock Out rose trees that are in containers inside to the garage, basement or shed. The containers do not provide much protection against the winter weather. Prune Knock Out rose trees in the beginning of spring to a height of 12 inches to promote new growth. Knock Out roses should be pruned in the early spring months, which in Florida usually means late February and into March. It's also acceptable to trim them when needed, throughout the year. In Florida, Knock Out roses usually don't need a full pruning; however, it's good to trim them occasionally so they're shaped in order to meet your goals involving how they look. Wait until after the first year to prune them. They are healthier and hardier when they've been allowed to grow their own way during the first 12 months of life. Trimming and pruning your Florida Knock Out roses will promote new growth and enhance the shape of your plant. Dead leaves and branches won't be a problem when clipped off. These roses are one of the easiest to work with since they don't need constant attention. Trim as needed but only prune once every 2 to 3 years. Take a good look at your plant to see if it needs pruning at all, because Knock Out roses are easy to grow in Florida. Determine the location where you would like to plant your Knock Out rose bush or bushes. In addition to spacing also consider the light and drainage requirements of the plant. Measure five feet from the closest structure, tree, plant or other stationary object. Knock Out roses are capable of growing, when not trimmed, to five feet in width. Knock Outs also grow quickly in some cases and this can lead to problems if the roses are planted too closely to other plants or objects. Measure four feet from the nearest plant, tree or object using a tape measure. Place a stick or rock at the four-foot mark and step back to survey the area. Make any adjustments in location until you feel this is a good location based on distance, light and drainage. Dig a hole for planting the Knock Out rose with a shovel. Check the distance once again from the edge of the hole to the nearest object or plant. Make sure you still maintain a distance of about four feet. Knock Out roses are known as low maintenance, easy-to-care-for plants. They can be planted anytime the ground is not frozen. In hot weather they will require a lot more water until they are established. When planted in the spring or fall they require little maintenance. Knock Out roses were created by William Radler, a Wisconsin rose breeder and director of the Boerner Botanical Gardens. In 1988, he cross-bred Carefree Beauty and Razzle Dazzle. In 1992, he began testing the cross-breed. In 2000, the Knock Out rose won the All-American Rose Award. In the cultivar's first year on the market, more than 250,000 were sold. It went on to become the fastest-selling rose in history. Knock Out roses are fire-engine red in cooler weather and cherry red in the summer. The leaves are purplish-green, turning to a burgundy hue in the fall. It has terminal clusters of flowers, each of which are 3 inches wide. The Knock Out rose grows best in full sun or light shade. 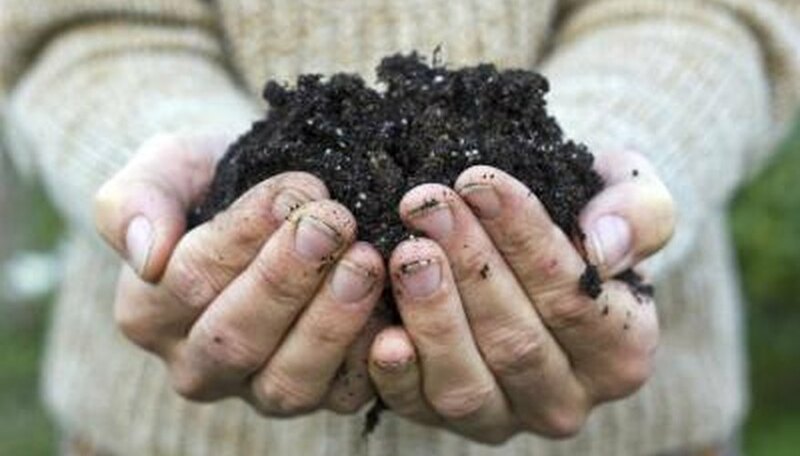 The soil should be fertile and well-drained. Water and fertilizer should be applied throughout the growing season for continuous blooms. Prune your Knock Out roses in spring before new growth appears. Prune them again during the growing season when you need to control the size of the shrub. The best rose bush currently available is the Knock Out rose, which comes in a variety of colors. The Knock Out blooms several times throughout the growing season, and the dead flowers fall off by themselves. It also offers superior disease resistance.